Why some of our clients chose to renovate and what they found most valuable in the process. Wondering if you should renovate your home or start over with a new build? The choice between renovating or simply starting from scratch often depends on many different variables. Both options have their advantages and both have difficulties, however, the best choice is the one that will most suit your long term goals and your budget. To help you navigate the process of figuring out the best option for you, we’re sharing what a few of our clients love about their renovated homes, and what they found most valuable in the process of working with an architect. Josie and Jared bought a house with renovating in mind, knowing it would be a good investment in their region. Features such as a basement apartment space create additional value in the property. Their goals for the renovation were simple and focused on integrating with the outdoors: a more functional entry sequence and storage for snow and mud, better solar gain and natural light, and to find opportunities for integration and engagement with the entire lot, yard, and neighborhood. The original home was broken into several rooms, and they wanted to see it more open from the entryway to the living room. After experiencing a protracted self-renovation project for a home in New York, they knew they wanted to have an architect lead their renovation from the beginning. Completing the project within their desired timeframe was important. Moving cross country is a huge endeavor, and we’re happy to have helped our clients create their dream home in their new town. Through the process Love|Schack, Josie, and Jared became friends and Josie and Lindsey just finished playing their first hockey season together. Our clients, Sarah and Morgan, chose to renovate their home because they loved its proximity to downtown and because they wanted to maintain a small footprint and some of the home’s original character. They wanted to open up the home, but knew the process of answering what would be structurally feasible and within their budget would be a process that required guidance. Initially, Sarah and Morgan thought they’d need to have a second floor addition above a garage with a roof deck to create the amount of space they were looking for. After discussing their lifestyle and what they were looking for in a home, we were able to understand their needs and help them reimagine the space to be more functional. Sarah was initially inspired by our Western Drive project, and after asking around and doing some research into other architects, she reached out to us. She felt our commitment to using healthy materials, understanding of place and energy efficient design was in-line with what she and Morgan wanted to accomplish in their home. 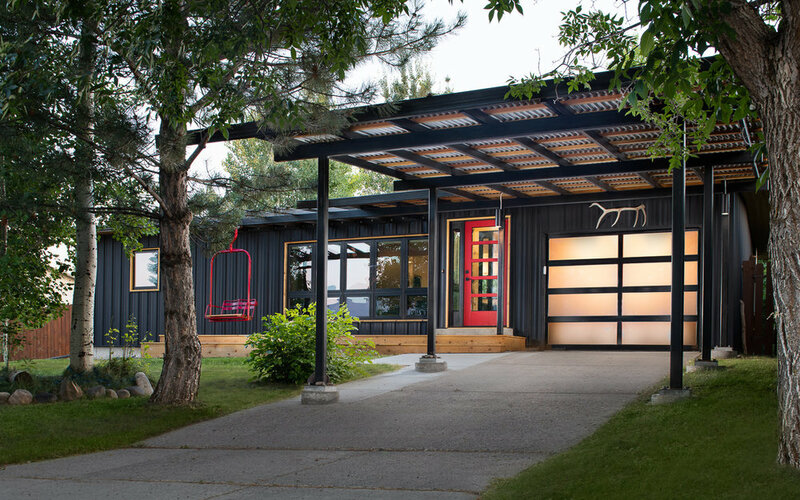 Our Western Drive project is an extensive renovation and addition to a 1960’s rancher in Bozeman, MT. Scott, the owner, decided to renovate because he wanted to remain in a neighborhood where he felt most at home. He also wanted to maintain a small footprint for lifestyle and environmental reasons. After comparing the outcomes of purchasing a new home to that of updating his current starter home, he decided that renovating was the best option. Scott leads a busy life, so he felt that the most valuable part for him was that the process was fun and anxiety free. Interested in discussing your own home renovation or new build with us?